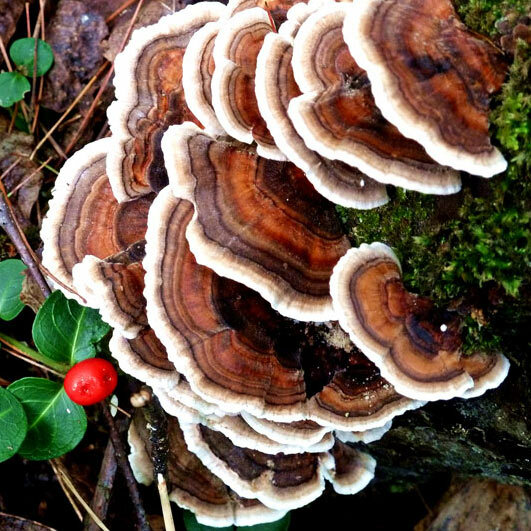 Coriolis Versicolor is the most extensively researched of all the medicinal mushrooms with large scale clinical trials on humans. The Coriolis Versicolor extracts: PSK ('Krestin') and PSP are shown to be of potent benefit in a variety of cancers, including Gastric, Oesophageal, Lung, Breast and Colorectal. PSK and PSP are both polysaccharide-protein complexes that are soluble in water but insoluble in ethanol. PSK contains 34-35% polysaccharide (~92% glucan) and 28-35% protein. Indeed, so strong are the benefits of these extracts of Coriolis Versicolor that they are the first prescribed port of call for many cancer patients in Japan and China.